It started as a technology test mission, but NASA's Deep Space 1 had become much more. In 1999, having already made a historic up-close encounter with asteroid 9669 Braille, the "spacecraft that could" was being pushed ever further with an extended mission to encounter two comets in a single year. But in November of that year, something went wrong. The star tracker, a device that acts as a sort of spacecraft compass, failed, rendering the craft blind in the stellar abyss with no way of relaying its valuable reserve of science data back to Earth. For Michela Muñoz Fernández, it was a chance to do something big. In February 2000, Muñoz Fernández, then a master's student at France's International Space University, arrived at NASA's Jet Propulsion Laboratory in Pasadena, Calif., for the start of her three-month internship. Her task was to help analyze communications between Deep Space 1 and the ground stations that make up NASA's Deep Space Network (DSN) -- a global system of powerful antennas for spacecraft communication and navigation. As the NASA lab that had pioneered deep space communication and managed the DSN, JPL was a mecca for aspiring telecommunications engineers like Muñoz Fernández. 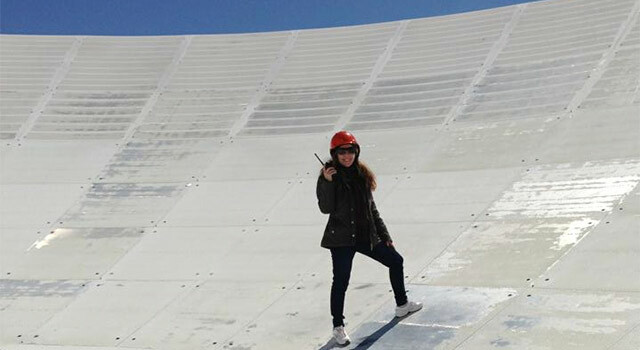 "My dream was always to work on telecom, doing telecom analysis for a deep space mission," said Muñoz Fernández, who before starting her master's program had worked for the company that manages the DSN complex in her native Madrid. "So for me, it was like a dream to work on Deep Space 1." Her dream quickly evolved into a career's worth of real-world experience when, soon after starting her internship, she was thrust into a team tasked with wrenching the science data from the wayward Deep Space 1 and potentially rescuing the mission altogether. Working with her mentor, Jim Taylor, and the flight team, Muñoz Fernández and the group quickly devised a strategy. If mission controllers could temporarily point the spacecraft close enough toward Earth, the telecom team could send commands through the spacecraft's high-gain antenna. The strategy required that Muñoz Fernández and Taylor analyze the signals coming from the spacecraft and send commands during the small window when the antenna was pointed toward Earth. If all went according to plan, a new software package would be radioed to the spacecraft instructing it to use its onboard camera as a de facto navigation tool. "Initially, the probability of getting the high-gain antenna pointed on Earth and keeping it there for a typical communications pass was significantly below 50 percent," said Marc Rayman, who at the time was Deep Space 1's Mission Manager. "But there were two mottos I tried to get the team to adopt: 'If it isn't impossible, it isn't worth doing,' and, 'Never give up. Never surrender.' I took the second one from the movie 'Galaxy Quest.'" The plan worked. In 2001, Deep Space 1 made a successful flyby of comet Borrelly, snapping hundreds of up-close photos of the comet. And the operation to save the mission went down as one of the most successful robotic spacecraft rescues in history. "I got so much done in three months. It's unbelievable what we got accomplished," said Muñoz Fernández. Having been accepted to a doctoral program at Caltech just before the start of her JPL internship, Muñoz Fernández carried the momentum from her experience into earning her doctorate in optical communications. 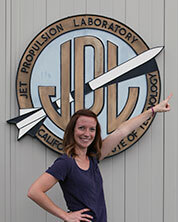 When she came back to JPL in 2006, she was hired as a flight and project systems engineer for the Space Interferometry Mission. These days, she divides her time between a busy schedule of research in deep space communications, techniques for model-based systems engineering for NASA missions, and task managing information architecture standards for space systems. And she says the lessons from her internship still play an essential role in her work - as does the mentoring she received from Taylor and Kar-Ming Cheung. "I had the best mentors, that's for sure," said Muñoz Fernández. "You work with many different people, and I realize how fortunate I was that the first time I came here, I got to work with these amazing people - not just nice people, but so knowledgeable technically." This summer Muñoz Fernández is preparing to mentor her own students, and she says she has plenty of advice from her experience to pass along to the next generation. "It's exciting to be able to teach new generations the knowledge that you have," she said. "And it's not only that the student learns from the mentor, but the mentor can also learn from the student. They can think of something that someone who was working here for a long time didn't think about because they come with a new perspective." 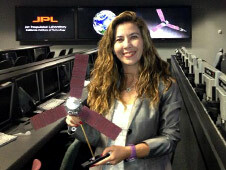 Dr. Michela Muñoz Fernández is a principal investigator at JPL. She has also worked as a systems engineer and science payload engineer on instruments and operations for the Juno mission. She currently directs research for model-based systems engineering for NASA space missions, is a task manager for information and architecture standards, conducts research on optical communications in deep space, and studies the complexity of DSN links. When people ask me what I want to do with my life, I tell them, "Every little kid wants to be an astronaut when they grow up - but I never outgrew it." It was in eighth grade that I realized I wanted to be an astronaut and explore our solar system. The journey wasn't always easy, however. 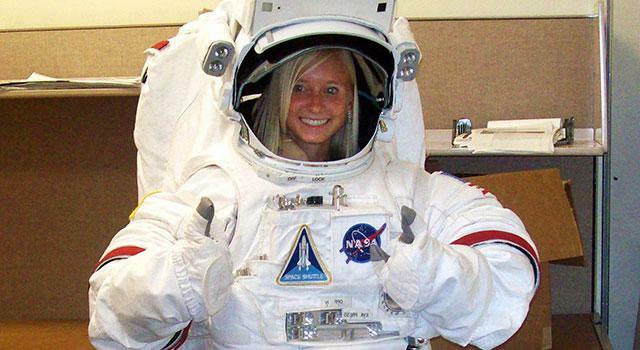 I was consistently laughed at and made fun of in high school when I would tell people that my dream was to work at NASA and one day become an astronaut. No one really expected me to stick to those dreams, let alone accomplish them. Fast forward a few years, and I entered college at the Florida Institute of Technology, where I double-majored in physics and space science to learn more about stars and comets. One moment I will never forget is orientation day for my department. A professor asked the freshmen in the room who wanted to be an astronaut, and every hand in the room shot up. I knew I was in the right place. In my sophomore year, an upperclassman sent an email around about a scholarship-internship program with NASA, called MUST (Motivating Undergraduates in Science and Technology). I figured it was a long shot, but decided to apply. To my delight, I was selected and given the opportunity to begin living out my dream by interning at Kennedy Space Center for the summer. I worked for Dr. Philip Metzger, a granular physicist who leads NASA's research into rocket blast effects for manned missions. In the Granular Mechanics and Surface Systems Laboratory, I designed and built experiments to study how the spray of lunar soil from a landing rocket will impinge upon and damage hardware at a future lunar outpost. This NASA experience changed the course of my career, in a very good way. I suddenly realized I was far more interested in the surfaces of planets and in planetary exploration than in stars and astrophysics, and decided after that summer to pursue planetary science for my graduate studies. 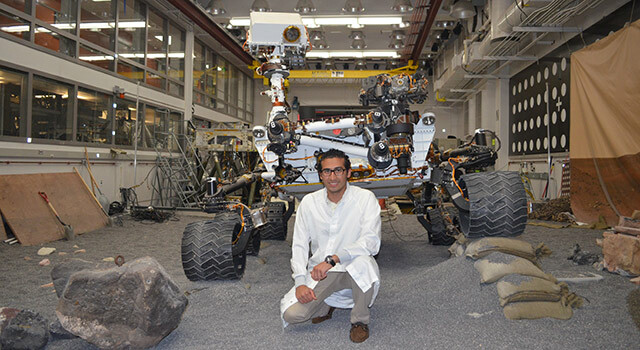 I returned to KSC the next summer to work with Dr. Metzger on a new project that involved studying the compaction and magnetic properties of lunar soil using various experimental methods. We were working on developing more effective ways to store large quantities of soil for mining. The summer before starting graduate school, I was offered an internship at JPL working on the proposed MoonRise mission, lead by my (soon-to-be) advisor, Dr. Bradley Jolliff. MoonRise would have been a robotic sample return mission to the lunar farside. I was part of a team of students who were tasked with designing an instrument to fly on the spacecraft. We designed a camera system that would have flown on the communications satellite and detected impact flashes from impacting meteorites. Unfortunately, MoonRise was not selected to fly, but the experience shaped my future career path. I realized I really enjoy the mission design and planning process and decided that summer that I wanted to both study the moon and plan for future missions. I am now a couple years shy of having my Ph.D. in Earth and Planetary Science, and have loved the journey. My research focuses on studying the effects of rocket exhaust on lunar soil properties and volcanic complexes on the moon. Once I have finished my graduate studies, I plan to apply for a position at NASA and become involved in mission planning. I hope to work on the problems associated with rocket exhaust effects on planetary surfaces and continue to research geologically interesting locations on the moon. Ultimately, I plan to apply to become an astronaut candidate and maybe even become the first woman to walk on the moon! 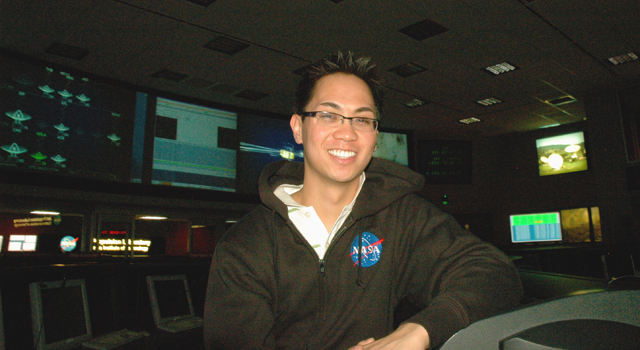 My NASA internships helped me realize my true passions and have paved the way for the career path I want to take. I'm incredibly happy in the field I'm in and hope that funding for both NASA and NASA education programs continues so that other students with dreams like mine have a chance to see them come true. NASA Student Ambassador Ryan Clegg uses Lunar Reconnaissance Orbiter Camera images to study the effects of rocket exhaust on lunar soil and to investigate silicic volcanic regions of the moon.